Absolutely, completely, 110% PERFECT! 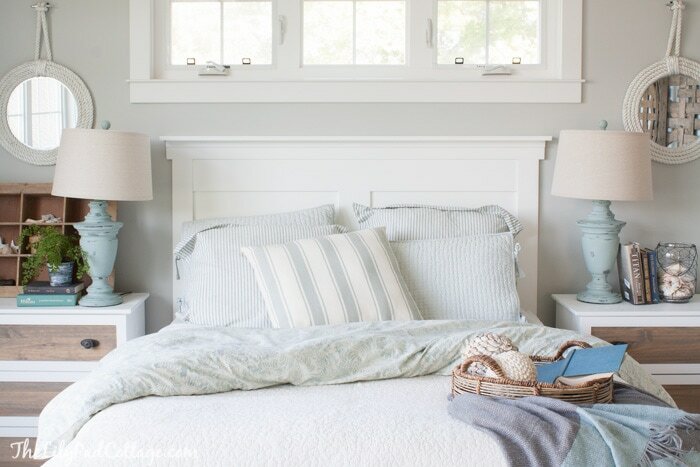 The entire thing from the bedding, to the window to the lamps are gorg! Pinned! what is the wall color? 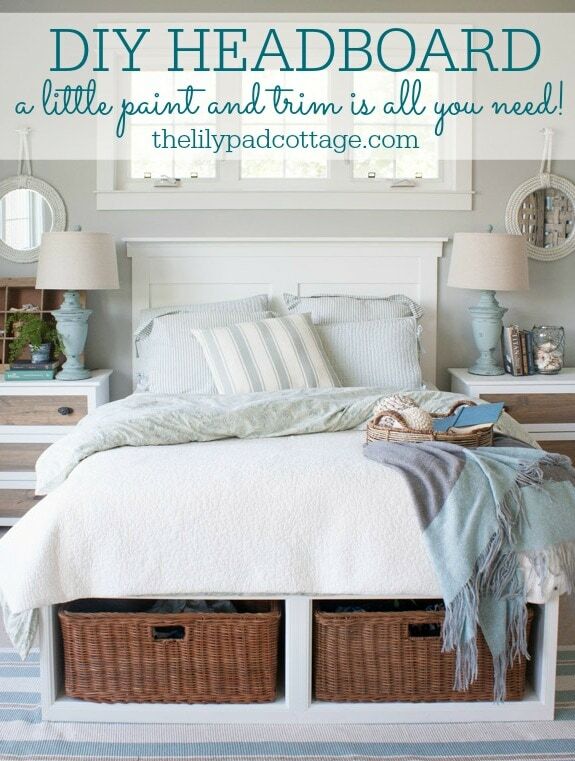 I am having my master bedroom painted soon and would love to do this! thanks! Just pinned it! I love the way it looks with the bed — perfect. I can’t imagine you shoving those pieces up the stairs. Please let me know what vitamins you take. Also, this is a very important question — do you have a tool belt? You know, one with a little embellishment on it- something girly, girly. And last, but not least — what color are your power tools — have you spray painted them yet to match your decor?? I can’t imagine you having any dull colored anything :-) Where was Buddy when all this was going down? I love, love, love it. I thought it was a complete bed frame until I read the post. It looks amazing. I think I could even try something like this; well, I am probably dreaming. Oh I laughed…one of my spare bedrooms is referred to as the black hole…..my dumping ground! And when it comes to moving furniture…well…I could definitely picture you doing this as just yesterday I played musical arm chairs….living room, sunroom, family room and my craft room got to play….and there is still a stray wing back sitting in the living room waiting for a new home! And the headboard looks great….amazing! Love your blog! I am so glad I’m not the only one who moves heavy furniture by themselves only to have major back pain for the next week and a half. Ha. I also totally get the rearranging furniture. I rearrange our living room at least four times a year. Sometimes you just need a change. Your new headboard looks wonderful too! I’ve definitely had days like this – haha! So glad it worked out for you. This room is just beyond stunning & I stared at the photos for a good 10 minutes. Pinning now! How come we get in the mood to redo the house when our husbands are gone? Could it be they would tell us that, “it can’t be done”. I am finally at the age where I think twice before I move heavy furniture (although, I lifted a cement planter into my trailer last night). I always figure if it’s going to get done, I have to do it. My husband tried to put together a new headboard I got from Wayfair and finally I sent him packing and in a few minutes it was together and I was making the bed. Your headboard looks very professional and the room is so peaceful looking. 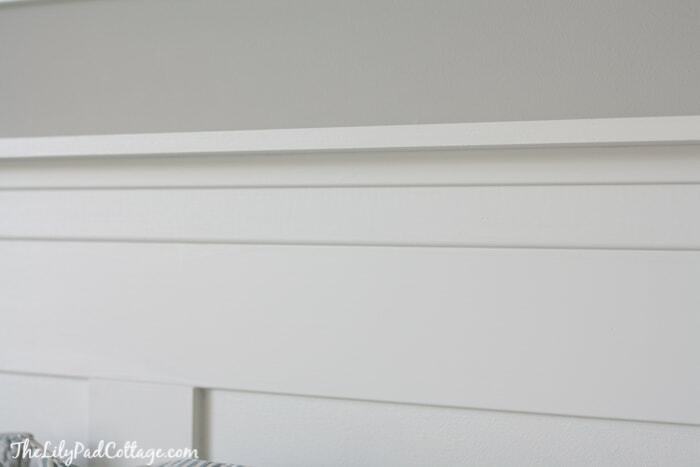 Love your I’m-doing-it-no-matter-what attitude :-) That is an awesome idea, to create the look of a headboard simply by attaching trim to the wall! 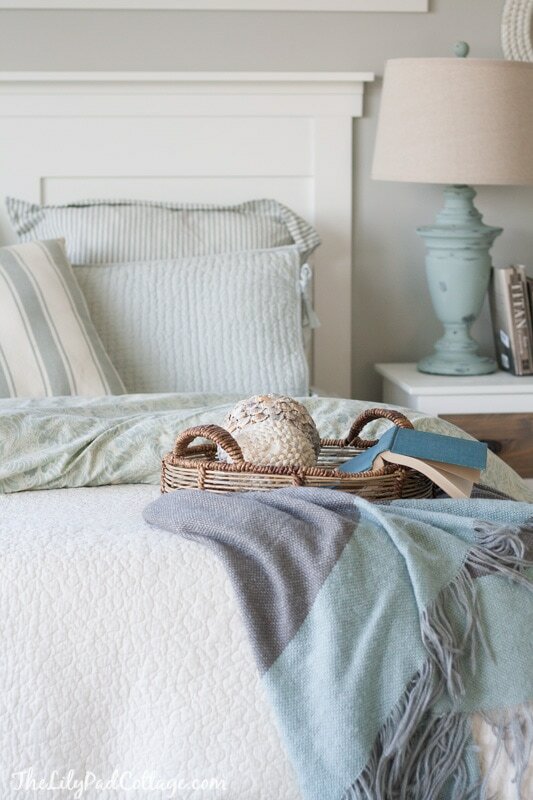 Your bedroom looks so calm and serene and pretty and beachy – lovely! Love this bed frame headboard, so substantial. I remember when I could move furniture by myself my hubby would think I was insane moving big pieces by myself. I could do it and it had to be done at that moment, LOL. Can’t wait to see the total reveal. I know the feeling of something having to move “now”!! I haven’t done a bed frame, but other furniture. 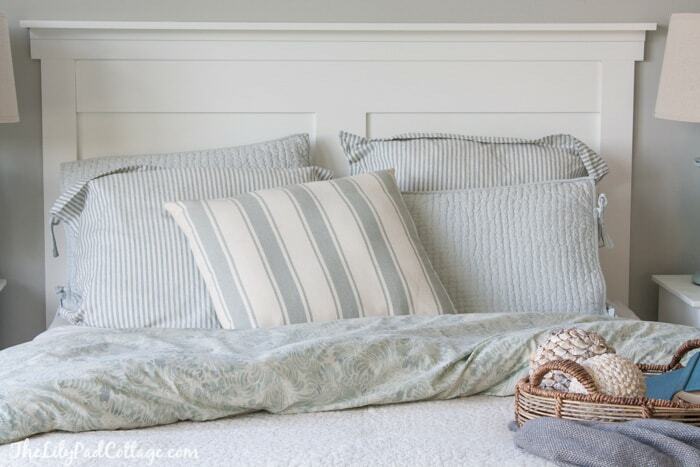 I love the idea of how you made this headboard! lOVE how the hedboard turned out! Totally finishes this bed off so nicely, the bedding looks great too! Glad you were able to use grandma’s quilt. You really amazed me one this one! Great job! I’ve had a few projects like that before! You just HAVE to do them right this very second! I remember shoving a tall dresser up our curved staircase a few years ago by myself… probably not my smartest moment! The headboard looks beautiful, and so does the bedroom!! ok you win the award for craziest moving job ha :) A curved staircase is no joke! You must be very happy as this is really a very lovely headboard. Thanks Karen I was happy it turned out so well. It turned out so nice! I love everything. Enjoy! What about the foot board? Did you buy or make? If you bought it, where can I get one? Hi Samm, it’s actually a platform bed from Pottery Barn, it’s all one piece that the mattress sits on top of. Love your bedroom . The headboard looks great . Could you tell me where you bought your duvet and what is the name of it . Thank You !! Hi Kathy, it’s from Pottery Barn, I think they still have it? Not sure the name of it! Turned out totally gorgeous! Did you refinish the end table/nightstand or did you purchase it? Love the contrast of the wood drawers! Plus what color did you paint the lamps! Absolutely LUV THEM!!!! Hi Lori! You can find both projects with more info on my project page here – https://www.thelilypadcottage.com/diy :) Thanks! Do you know about how much this ended up costing you? And what size bed were you making it for? It is gorgeous btw so thanks for posting!!! Thanks Amy! I think it was maybe $30 for all the wood? It was for a queen size. Hi Kelly, thanks so much for sharing! I am not a DIY’er (yet), but would definitely like to start with this headboard in my master. How many inches is it from the floor to the top board and how far down the wall did you stop the boards & paint? Any extra info or tidbits I may need to know would be appreciated. I hope I do you proud once I’m finished! Ohh this room makes my heart happy. Nailed it!! We have the same style! 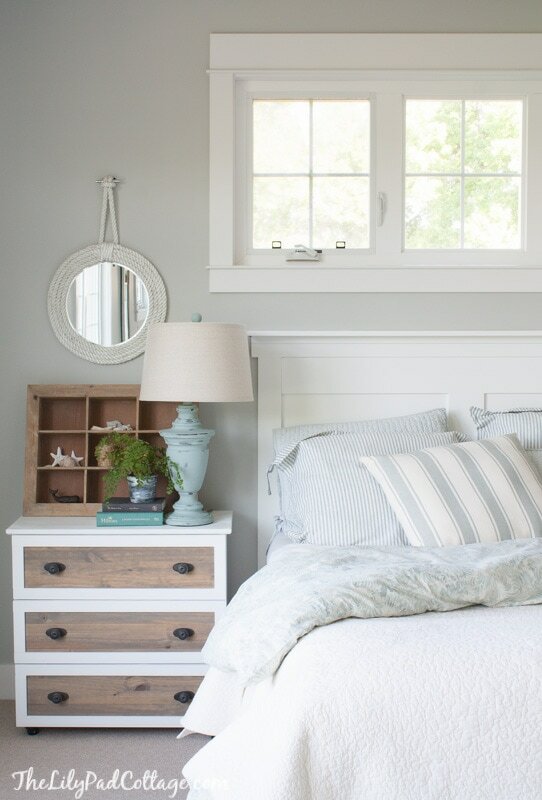 This gives me some inspiration to redo my master bedroom! Where are those mirrors from? Hi, I was wondering where you bought the baskets for the bed? Hi, I was wondering where you bought the baskets for under the bed? Wow! Impressive. I just tackled my first upholstered head board. Don’t think my skill levels are up to yours. Great job! Kelly, this is my first time to your site – I got here following a Pinterest pin of this project. It’s awesome, and I loved reading about your adventure. Thanks for sharing. I’m going to use your idea mixed with another idea. I’ll try to remember to let you know how it turns out. Thanks, again. I love this tutorial and I love those night stands. Did you enhance some you had purchased or did you buy them in the two tone colors? Would you share where you bought them? New at diy but want to try headboard. Can I just use a hammer instead of nail brad and what part did you nail and liquid nail. Thanks! You can use a hammer totally! Just smear a little liquid nail on the back to help it stick to the wall while you are nailing everything in. 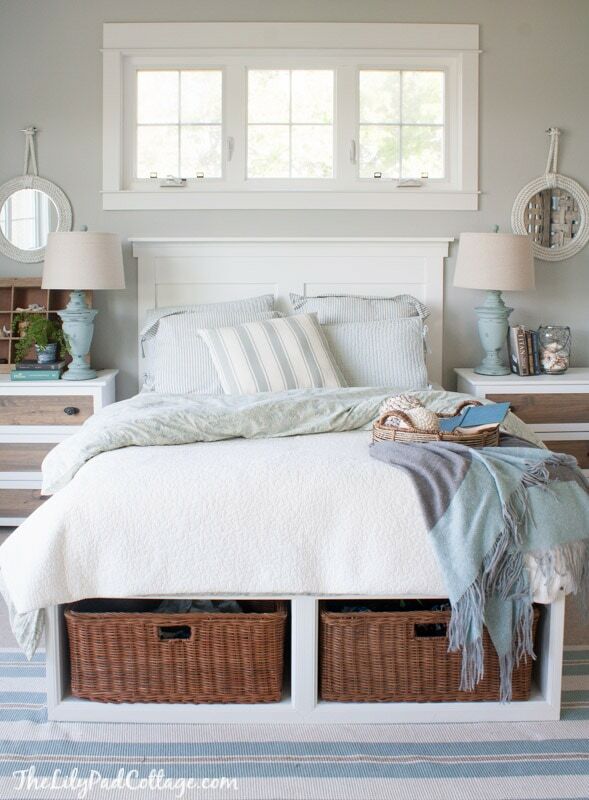 I love the bed base, with the baskets. Did you find a hack for these? I have a King Tempurpedic mattress so I need a substantial base. LOVE LOVE THIS, want want want this. Can you help??? Hi Ally the bed base is from Pottery Barn, this is definitely beyond my DIY skills sorry! 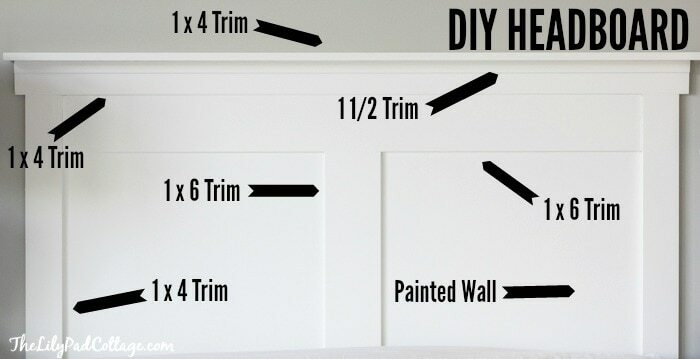 How did you attach the very top piece of trim that acts as a ledge? Thanks! Hi Christina I nailed it down into the board it’s resting on top of, does that make sense? So instead of into the wall down thru the board? I have that big striped pillow from Pottery Barn too. 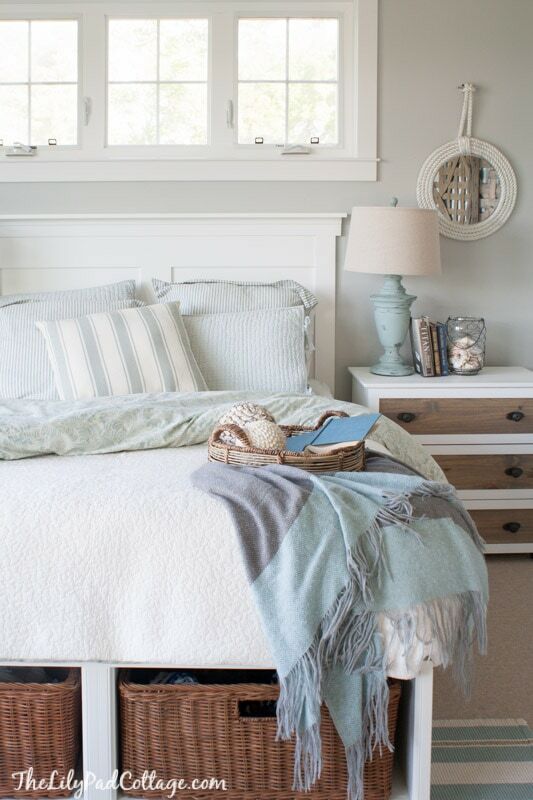 Love your bedroom, beautiful! Love the bedding! Do you remember the brand and style? It’s from Pottery Barn, not sure what style -thanks! You’ve created such a gorgeous bedroom and I’m impressed with your determination and headboard-building skills! We have the same bed and are inspired by you to build this headboard. I’m sorry if I missed it somewhere, but how high is the headboard please? Where did u find those big baskets?